"PURE ONE" will be displayed at the Monaco Yacht Show, and will be also available for viewing close to the Cannes Show. Please contact our office for appointment. 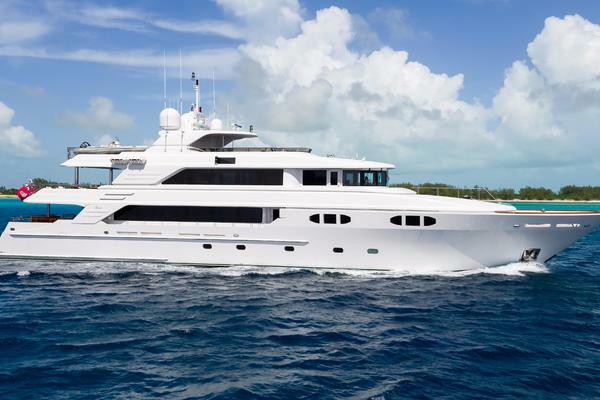 "PURE ONE" has striking lines and has been a head turner ever since her launch in January of 2009. This high quality semi-custom yacht from the renowned Arno shipyard was hull number 01 of the 46m luxury sport yacht model. Her sleek and proportioned lines disguise the fact that she has tremendous interior volume. Her aft deck and flybridge / sundeck offer complete comfort when relaxing outside. The 5 stateroom configuration features a Master Suite on the main deck forward, followed by a Cinema Room. On the lower deck, two VIP staterooms are aft, and two Twin cabins with Pullmans forward. A separate crew accommodation for 8 is all the way forward. Beautiful new interior and speeds to 34 knots make this yacht the ultimate combination of luxury, comfort and get and up and go. United Yacht Sales New Jersey would love to guide you through a personal showing of this 151' Arno Leopard Leopard 46m 2008. This yacht for sale is located in Palma Spain and priced at $9,500,000. For a showing please contact us by filling out the form on this page and we will get back to you shortly! One boards the yacht via an impressive aft deck and immediately understands the scale of the yacht. Sliding aft deck doors leads into the vast saloon that is bathed in natural daylight. There is a Bar on the starboard side and plentiful comfortable seating on the port side, as well as a TV forward. The starboard passageway leads you to a separate TV/Home Cinema room which is equipped with a large flat screen TV and surround sound speakers and a comfortable settee. Forward of this is the large full beam Owner’s suite with a walk in dressing room, king size bed (2m x 2m) and spacious en suite bathroom. A day head is found on the forward port side of the saloon. A crew passageway leads forward and down to the crew area and galley. The crew also gain access to the raised pilothouse from this passageway. The comfortable stairway leads down to the guest suites. Two mirror image VIP’s are aft. Both have ample storage space including king size beds (2m x 2m), full length wardrobes and very comfortable en-suite bathrooms. Forward are the two large twin cabins, both of which have an extra Pullman in each cabin. Once again the bathrooms are very generous in size. Forward of the guest areas, below deck is the separate crew accommodation consisting of the galley to starboard, a large crew mess to port and three bunk bedded cabins and one double bedded Captain’s cabin for a total crew of 8.